In his book Cancerproof Your Body, Ross Horne wrote about the role of the ileocecal valve and appendix in maintaining colon health, and why the Western preference for sitting toilets can cause problems for these two organs. 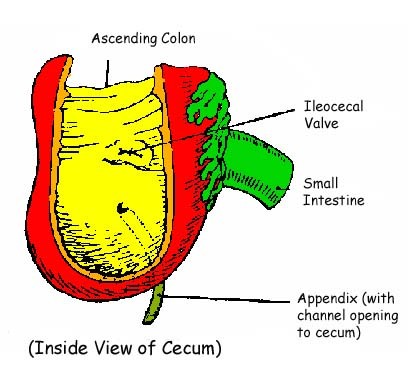 "The ileocecal valve which is located between the intestine and the colon," Horne wrote, "serves to prevent the colon's harmful substances and bacteria from returning to the intestine." The ileocecal valve acts like a one-way valve. It allows digested food in the small intestine to pass into the colon, but prevents waste in the colon from entering the small intestine. Many doctors believe that the appendix is an organ that does not serve any useful function. This erroneous belief explains why during surgery, some doctors would routinely cut off the appendix even though there is nothing wrong with it. "Further protection to the (small) intestine is provided by the appendix….which secretes a powerful germicidal fluid. This germicide acts as a barrier protecting the (small) intestine from the entry of colon bacteria, and likewise protects the colon from any harmful substance entering it from the intestine." "(The) eventual weakening of the ileocecal valve further diminishes this (protection) barrier and permits toxins from the colon to enter the (small) intestine and add to further deterioration of the bloodstream." "So constant sometimes is the demand upon the appendix that it may lose function and become inflamed by poisons and harmful bacteria from the colon, causing appendicitis." For there is a simple and effective way to keep the two organs in tip-top condition: squatting.